Important News for some HP, Dell and Apple laptop owners! Over the last few years there have been an unusually high number of HP and Dell, and some Apple laptops, that have failed, and with no initial explanation of what caused the failure. As the list of failed laptops grew, it it soon became apparent these failing laptops were showing some of the same symptoms, and that all of them had the same graphics chip, made by the Nvidia Corporation. Reports like this one have been numerous, suggesting a growing negative view on how the vendors responded to the problems, echoing the angry posts and reports of the many, many (many) Hewlett Packard and Dell laptop owners who had a dead laptop, and no solutions. Many. I should mention, as is also stated at that site's report, that Apple's response to the situation is viewed as timely, and responsive. If you know of any family members or friends who you think may have one of these laptops, please be sure to let them know about the updated situation, and the Settlement website. All claims have to be filed (Postmarked) before the March 14, 2011 deadline. I have helped assess 5 or 6 of the effected laptops, and all I checked just quit starting up. A quick display of some lights after pressing the On button, and then nothing. But again, more details can be had on the symptoms at the Settlement website. Hi Idnew. Are those two lights the ones in front, such as the power or battery charge lights (or those same lights elsewhere)? Could I suggest unplugging the laptop, remove the battery, then press and hold the power button for at least a 30 count - the longer the better. Then leave it sit for 5 or 10 minutes, just to ensure no residual power remains. Then leaving the battery out, plug in the power adapter, and see if it will boot then. Yea, I have a Dell XPS M1330 that I have been here quite a few times for help, as well as sending it into Dell to replace the mobo 3 times (as well as sending it in for repairs unrelated another 2 times) already due to overheating problems. It is beginning to overheat again, and my extended warranty they FORCED me to purchase at their outrageous price last time when I sent it in, is now over. I may by used Dells again in the future, but never a new one, or a thin laptop. This thing was just built wrong, in my opinion. I wish I had read this before that March deadline, but oh well. Nvidia allocated $2,000,000 USD for the agreement. No doubt none of that was offset by Dell or HP. Either way, Bean Counters 0, users 1. Unfortunately, based on recent experiences, I sense some other HP DV 6x series laptops not on that list, should have been. Same no boot issues, or strange stuff like the DVD drive no longer being recognized, replaced, BIOS upgrade and on and on. All gone. FYI - the unit in my previous post was a dv6500. Hi Jintan. Friend brought it to me to see if I could get it to boot. Dell Inspirion*sic* laptop. Two tiny lights in front I think three were supposed to light up. Came here to see what ya'll were saying did some searches and I did take the battery out and see if it would boot with power supply but it just won't do anything. And another. Boot up, flash of lights, shuts down. Not RAM or other suspects. Had a bit of luck with one of these today. Had been reading online about various techniques that have worked for some. Re-seating the gpu really requires some type of BGA reflow/rework station, starting usually at around $1500 USD (likely one about $2300 is what is really needed). But kept seeing mentions of using a heat gun, melt solder on a US quarter coin, mark scratches in it (so you can verify when the temp melts solder), then heat the solder on the coin till it melts, which then reseats the gpu to the board. Fortunately I had a few dead boards to practice techniques on, and get any mistakes out of the way. Including using a cardboard square tube placed over the gpu, and hold it with an oven mitt, since the temp is about 850 degrees F. Hard to get a light on the solder to see it melt, and was concentrating on that so much, I didn't notice that the oven mitt and cardboard had started to burn until the smoke hit me. Ended up using bondo fiberglass mesh to protect the other board components. 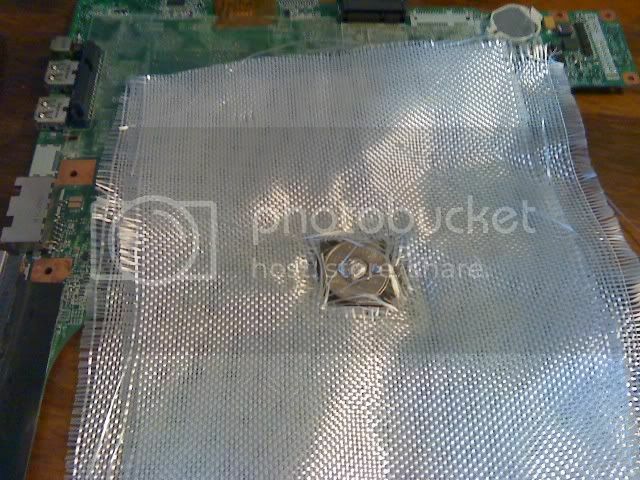 Cut correct-sized squares through a few sheets of it, placed some thermal paste sparingly around the first sheet's hole, to sorta hold it in place on the board, melted about a foot of 60/40 solder onto a quarter, then thermal pasted that to the gpu. Cut some cross-hatched scratches into the solder (a visual to tell you when the solder melts - ie. also the solder under the gpu). Need to remove any of those black tape pieces nearby they place on these boards (usually sticky enough to put them back later, if you're careful taking them off), or they'll fry. Most of the circuitry around the gpu is surface soldered mini-resistors. The solder on them may also melt a little, but as long as they are undisturbed, they'll just stay put once the heat is removed. Probably a biggy just to make sure no movement occurs until the heat is removed. Heat gun at high, solder shined bright when it finally melted, gave it a few extra seconds because the gpu solder is lead free, so needs a higher melting temp. Put the laptop back together, and, son of a gun, it booted normally. Ran it about 5 hours after while the battery recharged, and give it another long test run tomorrow to see if it still will just fail again. Last edited by Jintan; March 22nd, 2012 at 12:59 AM. For those that know defacing US currency is a crime in the US, the solder will just roll off when hit with a soldering iron, and the damage undone. So no turning me in to the authorities, please. old hands that ever wrought a siphon in lead know the melt point of lead, and how to detect it before it happens..
an IR temp reader is a handy, but costly thing. but, temperature crayons are (not) cheap. Mecanics use them up to 580 centigrade. the idiocy of this is that a blackboard chalk.. a colored chalk, (the blue chalk crayon most used by old style plumbers) will turn white gray at 290 or so.. (the green and red ones, them all change to a markedly different hue around there) and is what anybody can get. Oh, white chalk turn yellowish. for HOTTER, you would need the mecanics temperature finder grease crayons. I missed your post J. How have you been Meneer Triple Trappist? Too much difficulty as is guessing the temp below the gpu, but this trick seems to work very well. The melting solder on the coin let's me know the gpu solder is reseating the chip. I did another fix today. A Dell Latitude D620, that was on the original Nvidia settlement list. Works fine now. I won't continue to post these successes here any more. Just know it does seem to be a solution for this problem gpu issue. Thanks craisin. Want to mention that I have been using three sheets of bondo fiberglass, and after a few runs of doing this, the lowest sheet starts to slightly scorch and melt just a little, so needs to be replaced. Just adds to things to clean up after with the fibers kinda sticking to the gpu. I'm cheap, so will likely just rotate it to the top for a few more runs. Edit - Nah, on second thought this is probably not the right time to be so cheap. New sheet instead. Maybe every 3 applications. chalkboard chalks will discolour above 360, (melting of lead about 380), and mecanic's temperature finder crayons (usually used below 290 centigrade) would add a waxxy mark at least 20 centigrade before 'burn' (the discoloration of it shows the temp, it cooks to dark brown) at T°-max (designed as such.. melt, then cook/oxidize). the colour of grimbergen is too hot. for bending a siphon out of a lead tube, one has critical points. Each U turn had 7 markers. In one U turn, 5 critical markers, on a 90 degree bend, I coud use 3 critical. 5 or 7, where it gets to be be deformed most, we had to use a wooden mallet to get inside of lead in bend to outside. most times, just two colours of it. In a computer, I would NEVER use this. just some old tinker (tin-wright in its original meaning) knowledge I picked up in my tinker career. tips like this gets us away from computing?